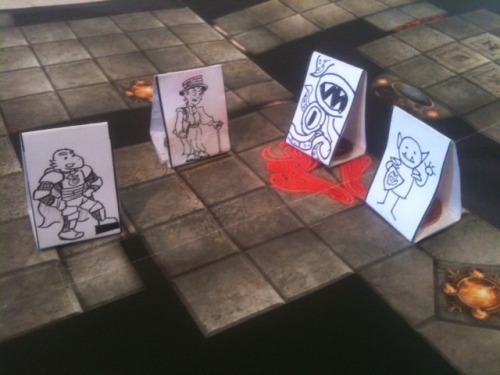 I’ve been drawing my own paper, stand-up miniatures for my D&D home game, inspired by the ones I got for being an Order of the Stick Kickstarter backer. If you’d like to use them, a link to the PDF file is below – just cut them out along the thick lines, fold on the thinner lines, and tape the bottoms together! (They work best if printed on cardstock, with a penny taped to the inside to make a more solid base). Feel free to use them for your games! And if you do, take a picture and let me know! You know, there’s a forum of people that deals with this kind of art. Why don’t you pay us a visit? P.S. Do backsides that align with the front for your minis, they would become awesome(r).